Warning! Danger of Choking due to small parts that may be swallowed. Not Suitabe for Children under 3 years. “They’re the world’s most fearsome fighting team, they’re heroes in a half-shell and they’re green. When the evil Shredder attacks these Turtle boys don’t cut him no slack! This fun and colourful jigsaw puzzle is cut into 35 pieces and measures 26 x 18cm when complete. Children aged 3 and up will love doing this puzzle, over and over again…. This toy costs approximately £3.99 (for the latest and best prices make sure you check our retailer list for the Teenage Mutant Ninja Turtles 35pc above). 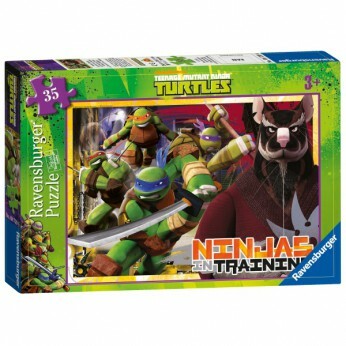 In our review of Teenage Mutant Ninja Turtles 35pc we classed it as being suitable for ages 4 years, 5 years, 6 years, 7 years, 8 years but recommend you check the manufacturer specific advice before purchasing.